by prominent African-American educator Lucy Craft Laney. The school offered a comprehensive education of “the heart,the hand and the head,” and Haines graduated respected leaders, doctors, lawyers, teachers and nurses who would playan important role in African-American local, state, and national history. 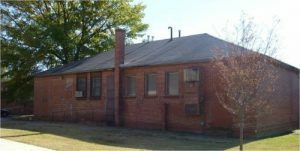 The Haines Normal and Industrial Institute was individually listed to the National Register of Historic Places in 2008 and also recognized with a historic marker by the Georgia Historical Society in August of 2009. Due to the building’s isolated location and development pressures on the campus, the building is in danger of being demolished so a more modern facility can be built on the current location. Potential Uses: Continued current use as educational facility or as a multi-purpose building for school activities. programs of the National Register including available grant funds and the tax incentives for certified rehabilitations.